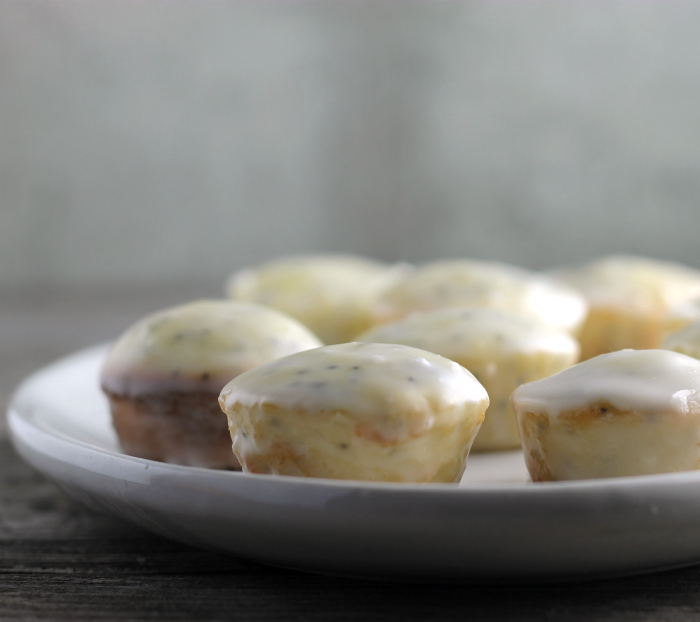 Lemon poppy seed cake bites, little cakes baked in mini muffin tins with a big taste of lemon. I can tell that the holidays are here. My clothes are already starting to feel tighter. UGH!! So these lemon poppy seed cake bites may be part of a solution; well at least enjoying sweets, but not overeating. That is if you can persuade yourself to eat just one, that may be a problem. But seriously I love desserts that come in little servings. The whole thing started at my granddaughter’s birthday party. Someone had brought some lemon cake bites to her party and they were delicious. They were not homemade, but I was sure that I could make some that would taste as good as the ones at the party. 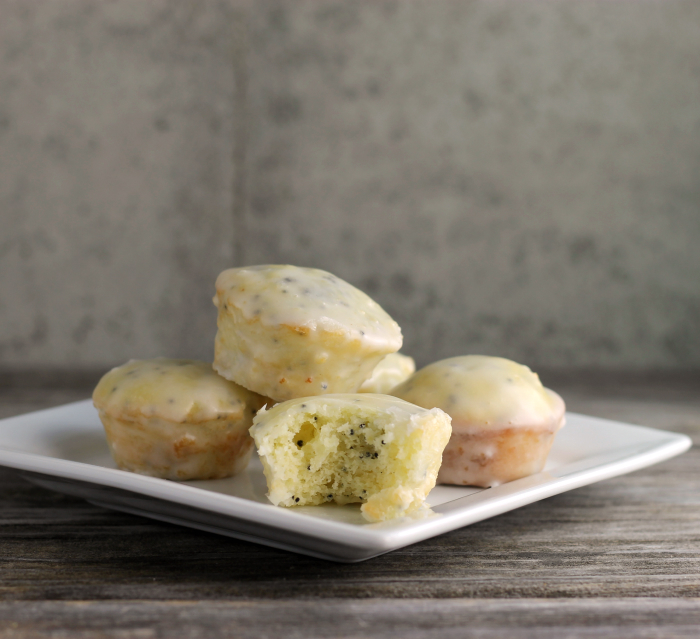 The lemon poppy seed cake bites are a basic cake, but they are baked in mini muffin tins. Yes, they take a little bit longer to make than a larger cake, but they are totally fun. Then the whole mini cake is dipped in a lemon icing for more lemon flavor. 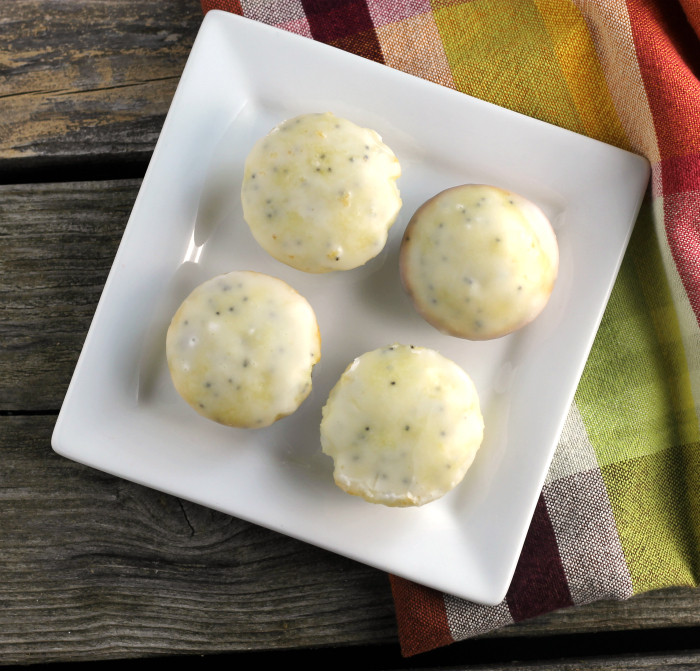 So when you take a bite of these lemon poppy seed cake bites you get a burst of tart lemon flavor then the sweet taste of the lemon cake, so yummy! And seriously I love these mini desserts. I do love my dessert, but with the lemon poppy seed cake bites I can have my cake, but not all of the calories of a slice of cake. Do you make mini desserts? If not you need to try these lemon poppy seed cake bites. Thank you for stopping by today, I hope that you will stop again!! Better yet, sign up for my newsletter and never miss a recipe. In a medium bowl beat the sugar, butter, and lemon zest with an electric mixer. Add the eggs beating after adding each one. Combine the milk and the lemon juice. Alternate the flour and the milk lemon mixture. Starting with the flour and ending with the flour. Fill the mini muffin tins about 2/3 full. Place the tins in the preheated oven and bake for 16 to 18 minutes or until the cakes bounce back after touching them lightly. Remove from oven and remove from tins. Set each cake bite on a cooling rack to cool completely. In a shallow bowl add the powdered sugar gradually add the lemon juice (by tablespoons) until you have a thin icing. Using a fork place each cake bite in the icing, turning until the whole bite is covered with the icing. These cake bites freeze very nicely. Check out this recipe if you like individual desserts. Lemon and poppy are such a delicious combo! 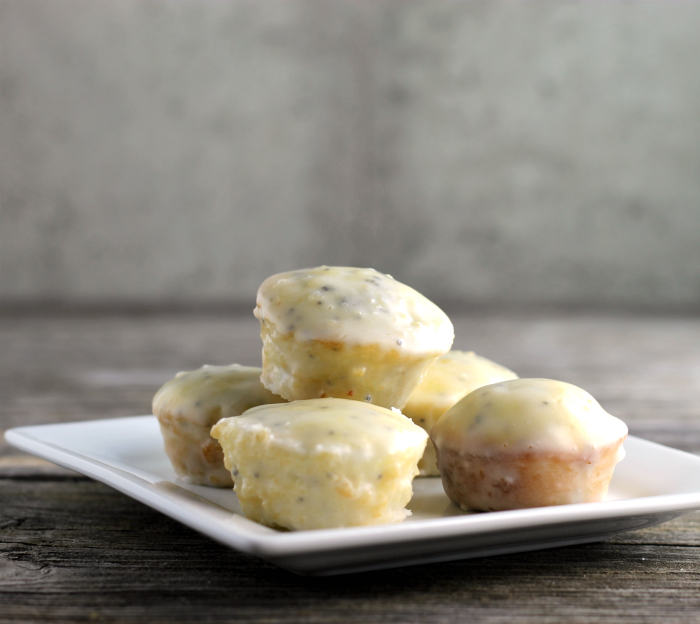 These mini muffins look beautiful and very tempting with that citrusy glaze. Ooh, I love the built in portion control—–but, I have a feeling I’d have to sample more than just one! Hope you had a wonderful Thanksgiving!! I totally know what you feel about the clothes fitting tighter, Dawn! We’re really trying to watch our diet around here right now (I know…I know…we picked the worst time of the year to play this game!). The mini version of this lemon poppy seed cake would be a great way to get my sugar fix without going overboard. Looks delicious!